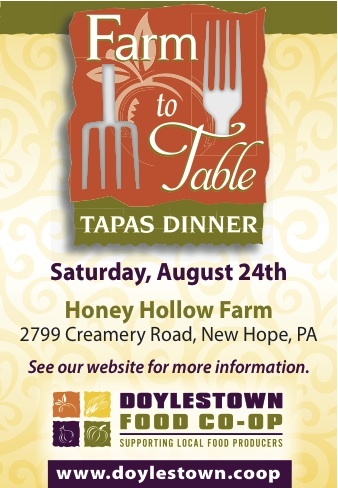 Doylestown Food Co-op will host its first farm-to-table dinner at Honey Hollow Farm in Solebury Township from 6 to 9:30 p.m., August 24. Chef Michael Kanter of Puck will create a feast of small plates, or tapas, from locally sourced ingredients. Guests can bring their own beverage of choice to the rain-or-shine event; water and iced tea will be served. Event hosts and farm owners Graham and Layla Phillips will share their plans to transition the farm, which is more than 200 years old, from conventional to organic farming and to establish an organic farm supply business. Amid views of the livestock, fields, farmhouse, barns and other outbuildings, Lori Rosolowsky and Jazz with Friends will perform. “We see this as a wonderful way for people who care about supporting their local food economy to come together and share the bounty of the region,” comments John LaSala, Co-op board member and event chair. For more than two years, the Co-op has been showing movies, hosting book club meetings, staging TED presentations and taking other action to educate the community about the importance of eating locally. The Co-op is committed to giving consumers convenient access to local foods and to supporting local farmers and producers. It plans to open a brick-and-mortar store in 2013. Cost: $70, Co-op members; $75, nonmembers. Location: 2799 Creamery Rd., Solebury Twp. For tickets or more information, visit Doylestown.Coop/calendar. This entry was posted in NA BuxMont, NewsBriefs and tagged Doylestown Co-op, events, farm to table, tapas by Healthy Living Bucks and Montgomery Counties. Bookmark the permalink.